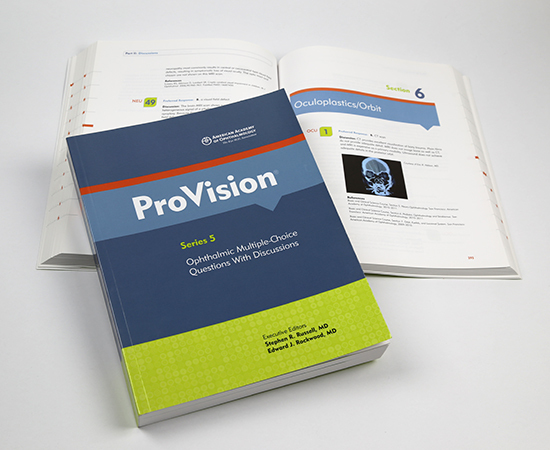 purpose: To help practicing ophthalmologists and ophthalmology residents assess their clinical knowledge, develop a self-directed learning plan for continuing medical education, and prepare to fulfill the requirements of certification renewal. Content includes questions and answer choices along with the preferred responses, detailed discussions and references. role: Art directed and designed cover and interior based on marketing creative brief and design memo. Worked with print production manager, compositor, editor and marketing manager to develop the book. Set up interior design and type specs for compositor to follow. Prepared cover for printing.